Location: Iskenderun district of Turkey. 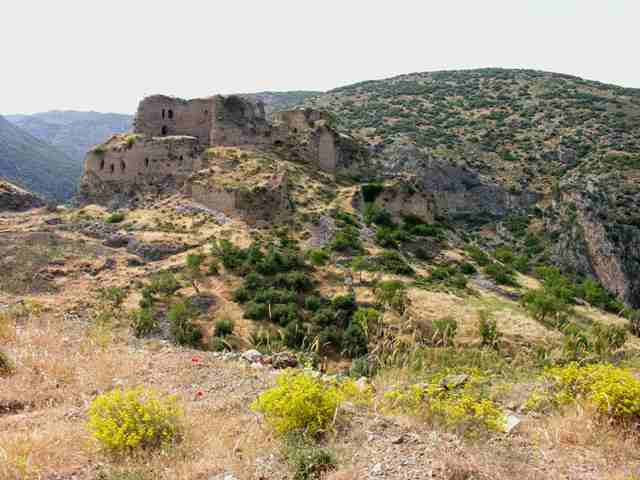 Notes: Bagras or Baghras, ancient Pagrae is a town and its nearby castle in the Iskenderun district of Turkey, in the Amanus Mountains. Strabo's Geographica mentions it as being on the borders of Gindarus, "a natural stronghold" leading to the Amanian Gate or Amanides Pylae over the Amanus Mountains. The castle of Pagrae was erected by emperor Nikephoros II Phokas, who stationed there 1000 footmen and 500 horsemen under the command of Michael Bourtzes to raid the countryside of the nearby city of Antioch. The castle provided a base for a force to cover the Amanian Gate. It was built in two levels around a knoll, the fortification resembling Armenian work, and with water supplied by aqueducts. It was then rebuilt about 1153 by the Knights Templar under the name Gaston (also Gastun, Guascon, Gastim) and held by them or by the Principality of Antioch until it was forced to capitulate to Saladin on 26 August 1189. It was retaken in 1191 by the Armenians (under Leo II), and their possession of it became a major point of contention between them and the Antiochenes and Templars. After much negotiation, it was finally returned to the Templars in 1216. According to the Armenian chronicles, it withstood a siege by the forces of Aleppo at about this time. After the fall of Antioch to Baibars in 1268, the garrison lost heart, and one of the brothers deserted and presented the keys of the castle to him. The remaining defenders decided to destroy what they could and surrender the castle. Despite the loss of the castle, Hethum II of Armenia and Leo IV of Armenia soundly defeated a Mamluk raiding force in the nearby pass in 1305.